How do I set the default program? How do I set the default program that I use? Any idea? Or should I use Terminal? I want to replace the default movie player with VLC media player, because the current movie player is useless to me. Try opening the properties (right click -> Properties) of the file type you want to be always played by VLC. If you're really desperate, just manually edit the file ~/.local/share/applications/mimeapps.list. Just add this under the [Default Applications] section if you want it to be default, or under [Added Associations] if it shouldn't be default. 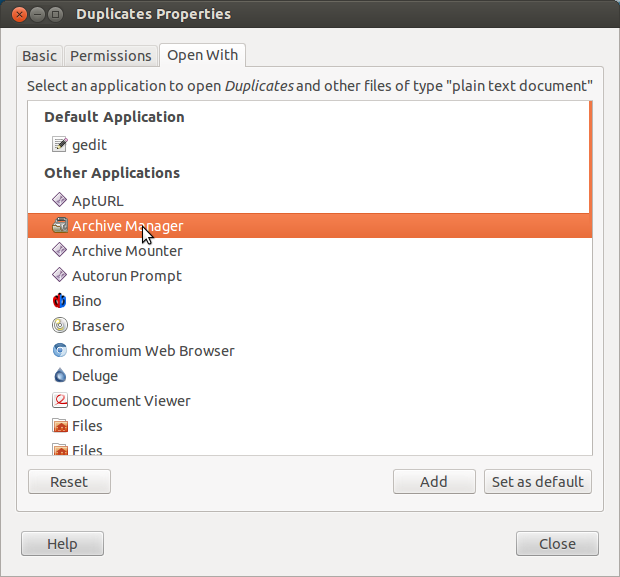 Use Ubuntu Tweak - it has a file association manager and you can choose which programs open which file types. EDIT In newer versions of Ubuntu, follow Paulius's answer, the option has been added to the Properties -> Open With screen. Choice number one: Open a terminal where your file is and do the following command. Press 1 if you see vlc, if not, chose the Other solution (3 in that case). Then type the name of your application followed by %f. And then do the step above. I was having a similar problem with PDFs; I had installed Adobe Reader, but I couldn't get it to open them as the default application - it didn't even show up on the lists! I checked the mimeapps.list file listed above, and it was already listed as default there. I right clicked on a PDF and chose "Properties." I opened the "Open with" tab. Clicking on the "Reset" button made Adobe appear as the default, and now it works. I guess that "Reset" was necessary after the (rather inconventional) installation to register it as the default program. In my instance I wanted to add PlayonLinux to select as a program to open .exe files, instead of always using WINE. But I wanted Wine to show up too. This way they both options will show up when I try to load a Windows .exe file. If you right-click the properties on the file, and for instance say I eventually do want to make PlayonLinux the default for Windows .exe files, all I need to do is tell it to be set as default. And it will change. You can check the mimeapps.list (~/.local/share/applications/mimeapps.list) to double-check and you'll now see it will have replaced WINE under [Default Applications]. If the System Info > Default Program doesn't work, then you could try right clicking on whatever video/movie file you want to play, then click Open With, and then select VLC. For Dolphin (KDE), right click the file to get a Properties window. Under Type is a button for File Type Options, where you can modify filename extensions. Add the application if it's not in the bottom list. To make it default, move the application you want to the top of the Application Preference Order list. I tried a number of these solutions with null result. This is really useful for updating the default apps used by GTK when using a Qt based system without having to install any GTK-based apps. choose one of the applications in the list and click "Set as default". Then, you can use Nautilus again with the updated file associations. It is not the most convenient solution, however, it avoids fiddling around with config files in the back. If possible, please, upvote the following Launchpad issue to get this fixed in Nautilus! Not the answer you're looking for? Browse other questions tagged default-programs or ask your own question. how can I change file association globally? How do you set your Default Bittorrent Application? How do I set VLC media player as default video player? Set Default music player to Banshee, yet it's still Rythmbox? How do I set Guayadeque as the default music player? Default App for opening videos is SMPlayer, then why videos are being opened in Movie Player? How do I change which application opens xml documents by default?